MobeeFree Download | Rates | Dailer | Cheap Calls Pakistan | Free Pc to Phone Calls, Free Voip Calls to India International ! If you are looking for a cheap voip provider to Pakistan, then your search is over. Today we will discuss about MobeeFree which is offering inexpensive calls to many countries, specially very cheap calls to Pakistan. MobeeFree is affordable alternative for making international calls using your mobile and home phone. Mobeefree is a user friendly and high quality international phone service available for calling India, Pakistan, Bangladesh, Nepal, and Sri Lanka among other countries. Make Calls from your computer : Pc to Phone Calls. Make Calls from your mobile phone : Download the app available for many phones. Make Calls from home phone. It also offers web call method to make calls. You can also configure your voip device to call using Mobfree. Send SMS Message. Cheap SMS! 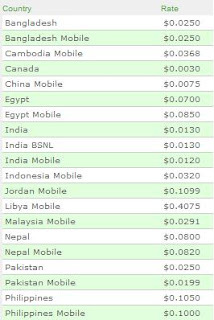 Calls to Pakistan Mobile at just 1.99 cents per min. Calls to India Mobile at just 1.3 cents per min. Please find image in the right of MobeeFree Calling rates to various destinations. If you want to make Pc to Phone calls, then you can try Mobfree PC application. Simply click the download link below and the installation files to your computer! After downloading, double click the installer file and you are set to go. Download mobeefree Software! Mobeefree is currently offering a promotion "Mobeefree Free Calls to Pakistan" : Free 15 minutes to Pakistan every Tuesday (month of Feb and March). NOTE: When dialing use + in front of the number.